Special Offer: Two kids ski and stay free with midweek packages at Holiday Valley Lodging! For a "Just Right" family vacation Holiday Valley Resort in Ellicottville, New York has all the ingredients. With 60 slopes and 13 lifts there is plenty of variety of terrain, including cruisers, glades, fun bump runs and parks. 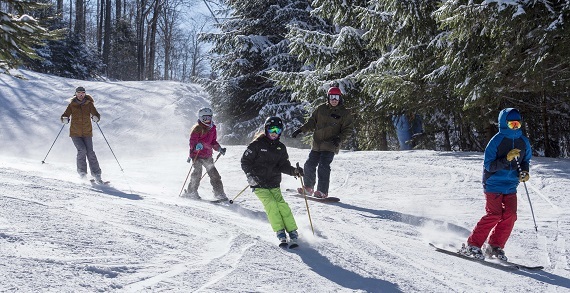 The children's ski and snowboard school, the Holiday Valley Tubing Company, the Mountain Coaster and on site day care provide activities for kids all day long. Slope side lodging is ideal for families, and the Inn at Holiday Valley and the Tamarack Club have outdoor heated pools and hot tubs. The fun loving Village of Ellicottville has great restaurants, unique shops and a welcoming small town atmosphere. And Moms and Dads are on vacation too...Ellicottville Oasis Spa and John Harvards Brew House are a great way to unwind after a day on the slopes. 3311 S. Old State Rd. 3665 Park Mill Run Dr.